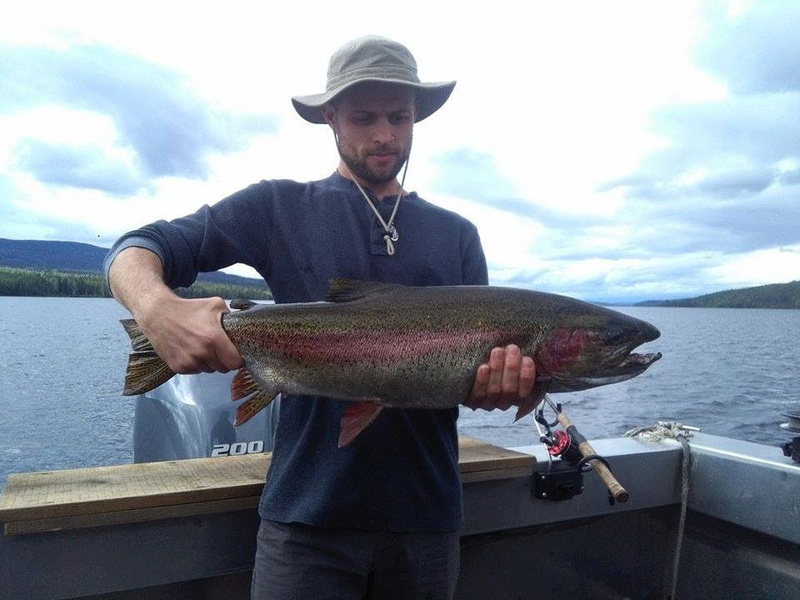 A huge rainbow was caught on Babine Lake this past week and measured 30 inches long with a girth of 16 1/2 inches making it over 10 lbs! This was caught on a guided trip through Tukki Lodge. There are some beautiful rainbow, burbot, and char to be had on Babine and booking a trip through Tukki Lodge would be a great experience for those unfamiliar with the lake. Call the Hoopers at 250-697-6249 or visit their website tukkilodge.com to book a guided fishing or hunting trip, rent a cabin, or even rent a boat. A lot of guides are hanging up their rods for the summer but that only means that there will be less boats on the water when searching for that Coho for the BBQ or that big Northern to get the ultimate fish pic. Anglers are still doing very well for Coho out of Prince Rupert right now with lots of Anchovy and Herring still in our waters. We have had reports of fish being taken on 3-5 inch spoons in a variety of colours and also on my personal favourite, the Coyote 4.0 Live Image blue spoon. I find that these spoons can mimic the larger anchovies or smaller herring and is very effective for Chinook and Coho. You can also try the Silver Hoard Coho Killer in any of the colours and will have success. Along with the Coho that are present in Rupert right now, we are also seeing a few Chinook mixed in and also the larger Northern Coho which can reach up to 25lbs. 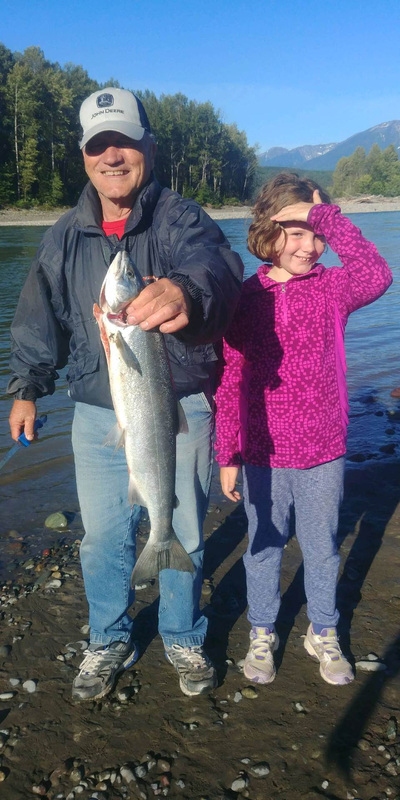 Out of Kitimat, the salmon fishing has been steady and good. There are some very nice Chinook being caught at the south end of the Douglas Channel around Aristibald Island. It's not easy to get out this far as Aristibald island is roughly 80 miles south of Kitimat but for anglers who are prepared to head this far out, the rewards can be amazing. Closer to Kitimat we are seeing the Coho ranging from the Kitimat harbour all the way down to open water. They will be running for the next month so expect fishing opportunities for Coho in the Douglas to remain good. Ground fishing has remained good over the past couple of weeks. We have seen some big fish caught with a 165lb halibut caught out of Rupert and a 120lb out of Kitimat. The fish are of course above the slot limit but we have been seeing some nice fish in the >133cm range boated lately. As long as the weather holds, the ground fishing should stay good. Crabbing and prawning have been good on the coast and we even saw a King Crab and small Halibut pulled up in a crab trap late last week. Head down to Oscars and talk to the folks there about any gear you might need for your next salt fishing trip. This is an exciting time of year with the Northern Coho coming in so stay tuned for reports and pics. The river is in perfect condition for fishing. The Pinks are in pretty thick and are a great fish to get kids 'hooked' on; all you need to do is cast out a small pink Croc and let the good times roll. The Coho run is starting to get good; try fishing Trout Creek early in the morning with a Coho spoon (size 45) or a Blue Fox (size 3 or 4). A few Steelhead are starting to show up and could make for an exciting fight! River is looking great! A ton of Pinks in the river and quite a few Coho. Reminder that you cannot target Chinook on the Skeena watershed after August 15th. River is low and clear and the fishing is good. Coho fishing has been quite good and more and more Steelhead are moving up the system. Reminder that you cannot target Chinook on the Skeena watershed after August 15th.